Colombo, February 26: The dramatic defeat of the ruling coalition in the landmark February 10 local bodies’ elections, has had a major impact on the political and economic situation in Sri Lanka.And it is bound to have an impact on Sri Lanka’s bilateral relations with the other countries in the South Asian region and the rest of the world, writes P.K.Balachandran in South Asian Monitor. Good bilateral relations are founded on political and economic stability in the countries concerned. Since 2015,when the National Unity Government (NUG) was established, Sri Lankahas been in sixes and sevens policy wise. There is policy confusion and policy paralysis leading to poor implementation of decision and schemes. Contradictions are the order of the day. It is this situation which has been identified as the root cause of the government parties’astounding failure at the polls. 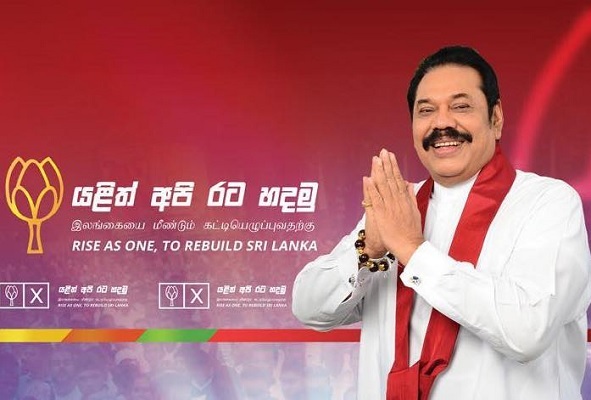 Out of the 340 local councils to which elections were held on February 10, 239 went to the opposition Sri Lanka Podujana Peramuna (SLPP) led by the popular former President Mahinda Rajapaksa. The ruling United National Party (UNP), led by Prime Minister Ranil Wickremesinghe, came a poor second with 41 councils and the Sri Lanka Freedom Party (SLFP) and its allies won a mere 10. The government coalition partners who have been running the NUGsince January 9, 2015, have been roundly criticized by the SLPP (known as the Joint Opposition in parliament) and asked to resign, dissolve parliament and hold fresh elections. Even as the government was facing the onslaught from the opposition, its constituent political parties were also in turmoil. They blamed each other. And within the parties, there were demands for drastic changes. In the SLFP, there was a strong demand for quitting the alliance with the UNP on the grounds that the UNP’s right wing neo-liberal and pro-West economic and foreign policies were responsible for the electoral disaster. Those in the SLFP who sought a rupture of the alliance wanted to join hands with the SLPP (which is but a breakaway group) to set up a new Left of Center and nationalist government. When this proved to be difficult because of the opposition of the President (who is alsoSLFP chief), they started a movement to remove UNP leader Wickremesinghe from the Premiership and have him replaced by the more amenable Karu Jayasuriya, currently Speaker of parliament. But the UNP would have none of it,despite serious differences with Wickremesinghe on his policies and style of functioning. The UNO stood by Wickremesinghe but forced him to give more importance to younger leaders in the party who reflect the masses’ concerns more accurately. The leaders of the SLFP then demanded that the President dismiss Wickremesinghe and appoint another person. But the 19 th. Amendment of the constitution would not permit that because it says that once appointed, the Prime Minister the incumbent cannot be removed except when he is replaced by his own party or loses majority support in parliament in a vote on a money bill. To mollify his party men, the President referred the matter to the Supreme Court and persuaded his followers to stick to the coalition with Wickremesinghe as Prime Minister. The SLFP members agreed to this but insisted that the economic development ministries should be taken away from the UNP and given to ministers from the SLFP. Alternatively, there should be a drastic reshuffle of the portfolios in which ministers whose policies brought about ruin should be shown the door. But taking away the economic ministries from the UNP would mean breaking one of the articles of the alliance — that the UNP will handle economic matters.Therefore, while promising to reshuffle the cabinet, the President adopted the expedient of using his National Economic Council (NEC) to lay down policy and review policy. The NEC met on 21 Februaryand reversed some policies. The President used the cabinet to reverse the plan to distribute 70,000 tablets in rural schools. He used the NEC to lift the ban on Glyphosate,a weedicide, the ban on which has been destroying the tea and rubber plantations. It is not clear as to what government’s policy will be in regard to various economic issues as there is no overall plan. But changes are likely to come piecemeal rather than sweeping. However, the overall direction is likely to be populist andnationalistic, to match Rajapaksa’s. But while Rajapaksa was able to combine populism with rapid economic development with massive infrastructure projects (with Chinese and Indian aid), the NUG has not been able to. It has neither executed infrastructure projects nor implemented populist programs. The NUG has failed even on the ethnic reconciliation front too. It promised Transitional Justice Mechanisms, none of which has been established. There is no Independent Judicial Mechanism to try war crimes cases, and the Office of Missing Persons is yet to be set up. Only land occupied by the armed forces from Tamil civilians has been given back,mostly. Thefailure on the reconciliation front has irked the UN and the West but no action is contemplated because as the NUG is seen as being pro-West and cooperative. And the alternative (Rajapaksa’s regime) is seen as being anti-West and anti-UN. Though the NUG is generally perceived as being friendly to India, in contrast to the earlier one, Indian projects signed in by it, have been in the limbo and likely to remain there. In Rajapaksa’s time, India completed the US$ 270 million to build 50,000 houses in the war-torn areas and built rail lines in North and South Lanka for US$ 800 million.But,under NUG no major project has got off the ground. Projects which are in the doldrums are: the LNG-fired 500 megawatt power plant in Kerewelapitiya; the LNG Terminal/Floating Storage Regasification Unit (FSRU) in Kerawalapitiya; piped gas distribution system and retail outlets for the supply of Compressed Natural Gas (CNG) to the transportation sector; a 50 MW (extendable to 100 MW) solar power plant in Sampur in the Eastern Province;joint development of the 84 giant oil tanks in the Upper Tank Farm in Trincomalee; a port, a petroleum refinery and other industries in Trincomalee; Industrial Zones or Special Economic Zones in various parts of Sri Lanka; and building the Mannar-Jaffna, Mannar-Trincomalee highway and the Dambulla-Trincomalee Expressway. It is learnt that while Prime Minister Wickremesinghe is keen on executing these projects, President Sirisena is not, out of fear that allowing India a large footprint in Sri Lanka will not be liked by Sri Lankans. He has to face Presidential and parliamentary elections in 2020. India and Sri Lanka had agreed to sign the Economic and Technical Cooperation Agreement (ETCA) by end of 2017, but there was so much of opposition to it from Sri Lankan businessmen and professions that prospects of signing it are dim especially because the NUG is likely to get more populist and nationalistic in the run up to the 2020 Presidential and parliamentary elections. Both the President and the Prime Minister are comfortable with China despite their opposition to Chinese projects signed in by Rajapaksa. In fact, after delaying the Chinese projects for about a year and a half, the NUG entered into agreements with China which were more favorable to the latter. Sri Lanka and Pakistan had signed a Free Trade Agreement in 2002 but till date, bilateral trade has notgone beyond US$ 247 million. This is due to lack of awareness and interest on the part of business communities in the two countries. According to experts, the potential is as high as US$ 2.7 billion per annum, which is half of India-Sri Lanka trade which is US$ 5 billion. Bangladesh has been trying to build trade and investment ties with Sri Lanka but still bilateral trade is only US$ 142 million per annum. This is because of a lack of complementarity and the absence of a welcoming culture in Sri Lanka thanks to nationalism and a fear of a “Muslim invasion”. Bangladesh has offered to fill the yawning labor gap in Sri Lanka’ s construction industry, but Sri Lankans are wary of a foreign influx especially of Muslims.On the contrary, the more progressive Bangladesh has welcomed and hosted Sri Lankan investors unhesitatingly. Sri Lanka-Nepal trade is negligible but relations are strong at the people-to-people level because over 45,000 Sri Lankan pilgrims visit Lumbini,the birthplace of the Buddha, every year. Nepal has invited Sri Lankan entrepreneurs to invest in the powersector but Sri Lankan entrepreneurs are not adventurous enough to seize the opportunity. Sri Lankans live in cocoon, neither willing to take risks abroad nor welcoming outsiders on their soil, having been under colonial rule from 1505 to 1948. Political instability combined with debilitating nationalism and populism have prevented it from seizing opportunities up for grabs in the world around it.